Welcome everyone to THE EARFUL, a delicious piece of new content from the minds over at the OH NO RADIO SHOW. 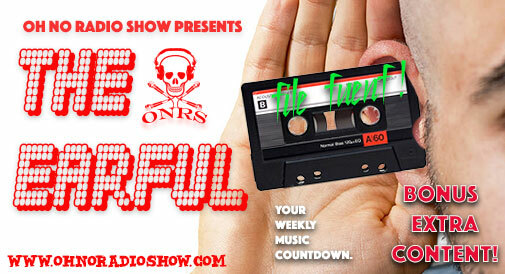 This bonus show will feature a countdown of songs we have been enjoying within our ONRS community giving you all a taste of musical variety and maybe even turning you onto to something you'll like! We hope to do these shows often and would love your feedback and input as well on what we should be listening to. So here it is "FILE FUENF!!" a.k.a. episode 5 of the EARFUL! Tristan Casara, known by his stage name The Avener, is a French deep house and electro music producer. Goldfrapp are an English electronic duo from London, formed in 1999. The duo consists of Alison Goldfrapp and Will Gregory. Vondelpark were an English indie pop group, formed in 2010 in London, England. a steadfast and inventive collaborator - not only playing bass and producing four albums with his band Hiss Golden Messenger, Scott Hirsch has finally made a solo album, a COUNTRY ALBUM called Blue Rider Songs. Billion One is an experimental musician and producer. His style is a mixture of abstract beats, shoegaze melodies and intricate sound design. Little Dragon are a Swedish electronic music band from Gothenburg, formed in 1996. Calibro 35 is a cinematic funk Italian band formed in 2007 in Milan. ALSO MAKE SURE TO CHECK OUT ALL PAST EPISODES OF THE EARFUL ON THIS PAGE RIGHT HERE!! This entry was posted on Monday, May 15th, 2017 at 11:01 am	and is filed under DefaultTag.